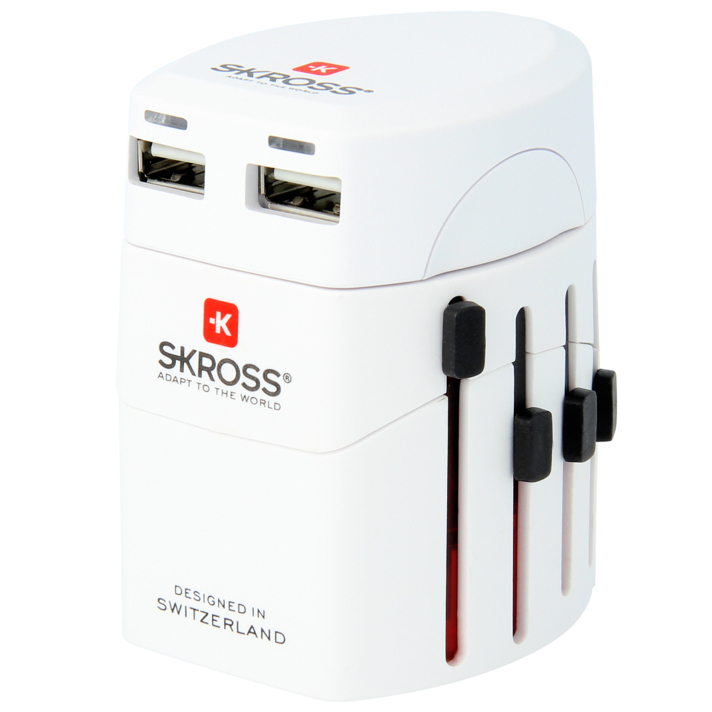 The SKROSS EVO World Travel Power Adapter is a 2 piece design with handy dual USB USB Charger ensuring your devices charge worldwide, on all continents. Available in White. 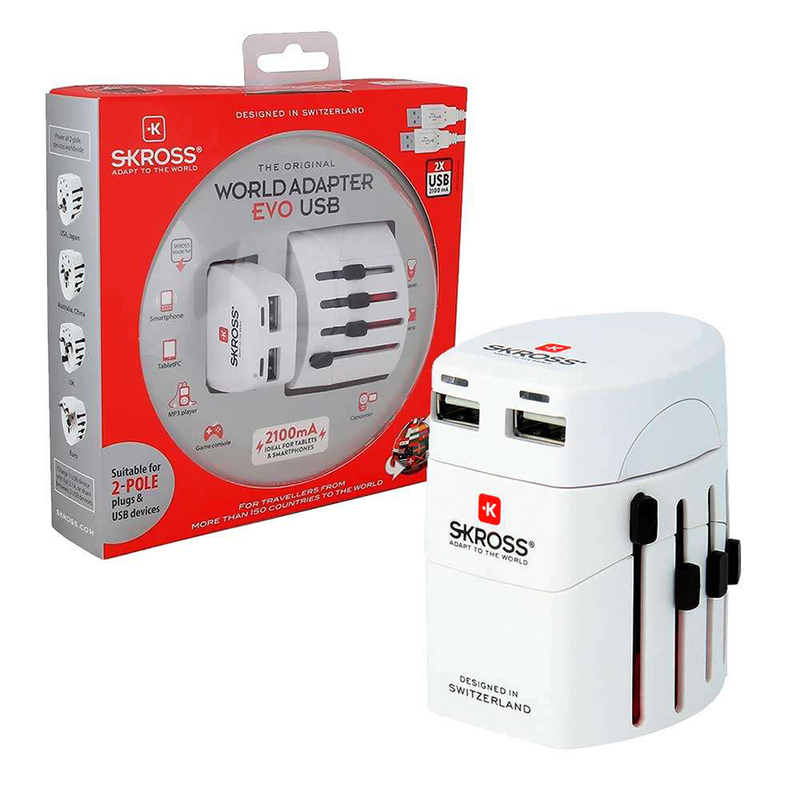 The EVO model uses its patented all-in-one country slider system for the connection of all 2-Pole devices such as the charger for your digicam or the netbook to the local mains sockets in more than 220 countries. 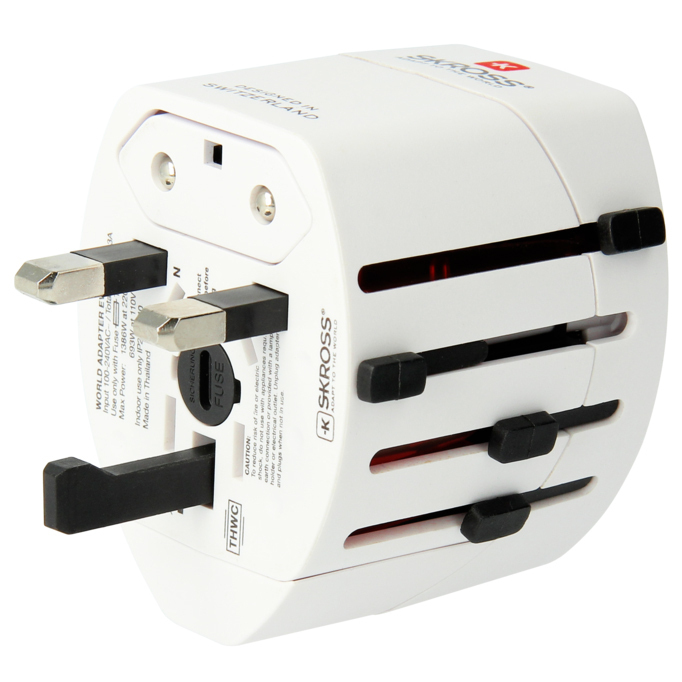 Cleverly-devised mains socket solution on top so that devices from the whole world over can be used. No matter if you come from Australia, Washington, London or Singapore, no matter if you travel to France, Kenya, Europe or America, you always have the right connection. 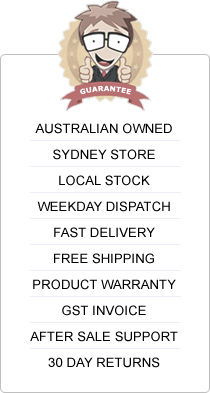 Available from a SKROSS Authorised Reseller in Australia. Suitable for equipment with earthed & unearthed plugs. 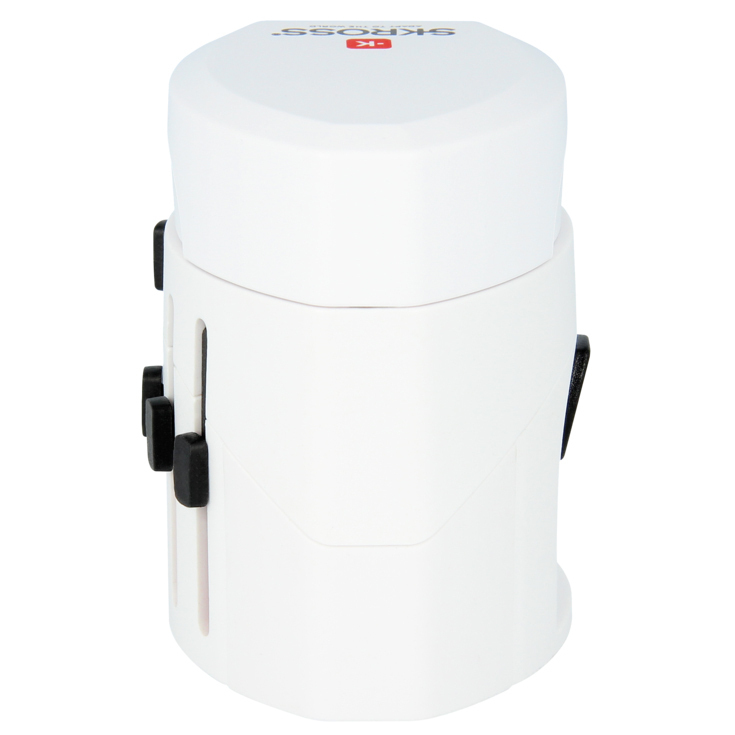 Receptacles for: Australia/China, Euro, UK, USA/Japan. Removable head piece for charging USB devices. 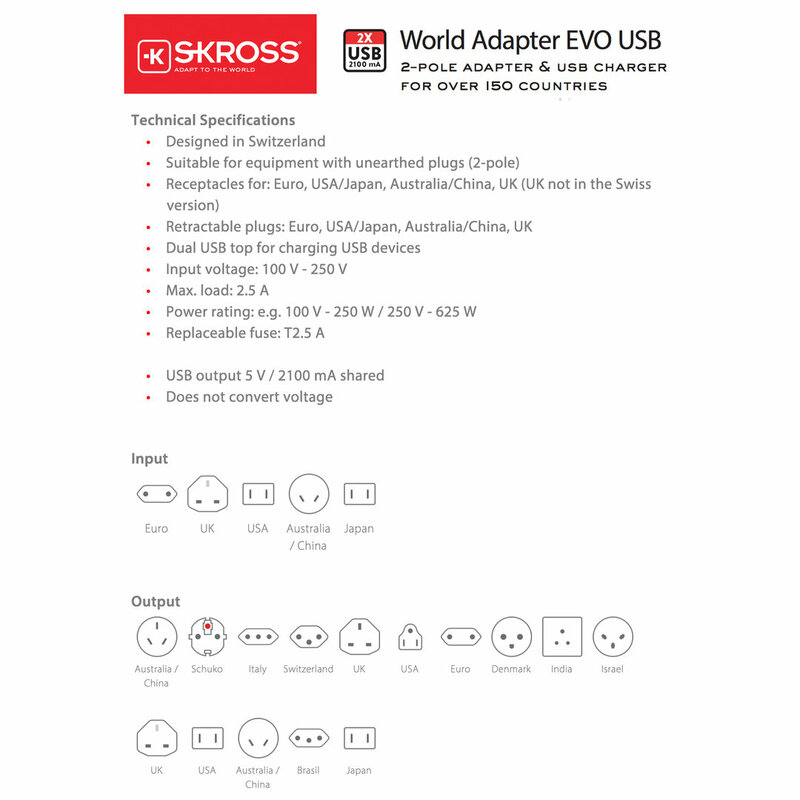 Retractable plugs: Australia, China, Euro, UK, USA, Japan. Power rating: e.g. at 100V - 250W / 250V - 625W. 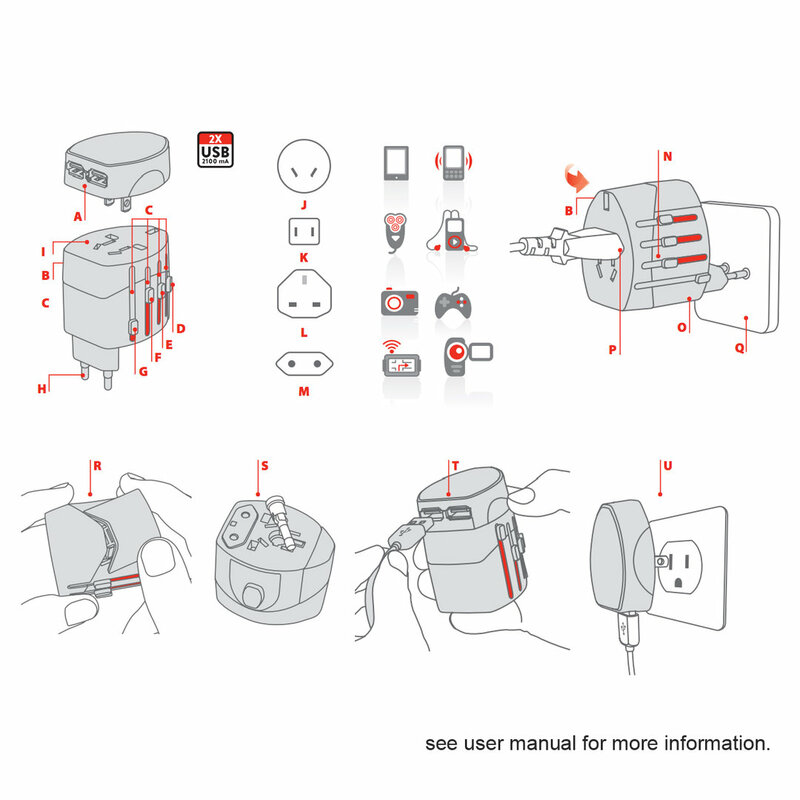 2-Pole devices such as cameras, shavers, camcorders, electrical toothbrushes and portable gaming devices. 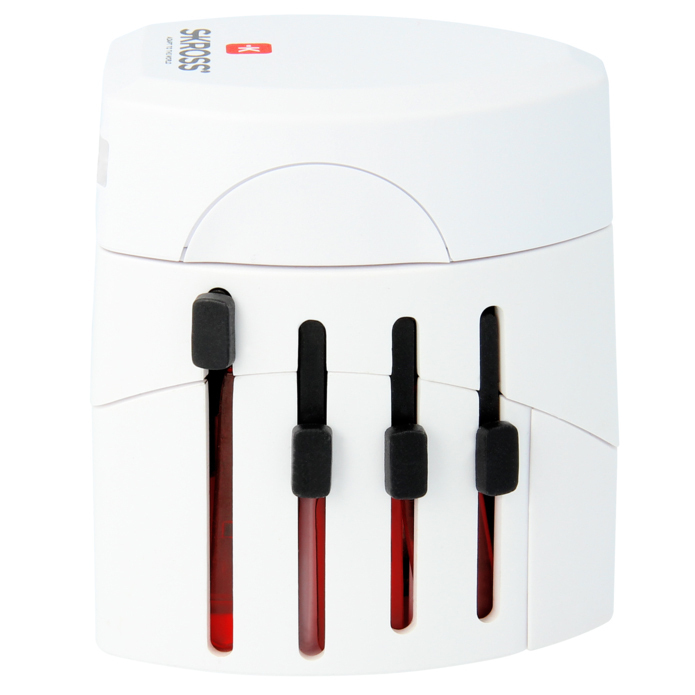 Suitable for mobile phones, tablets and mp3 players including Apple iPhone and iPad. The maximum load of this adapter is 2.5 Amp. Please check the power requirements of your 2-Pole device or appliance before use. 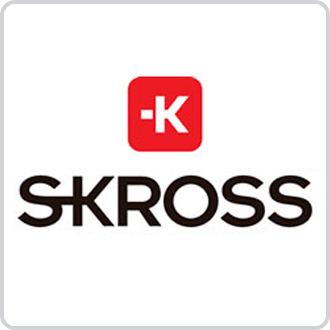 If a greater load or 3-pole is required, please consider the SKROSS PRO+ model. Adapter does not convert voltage. 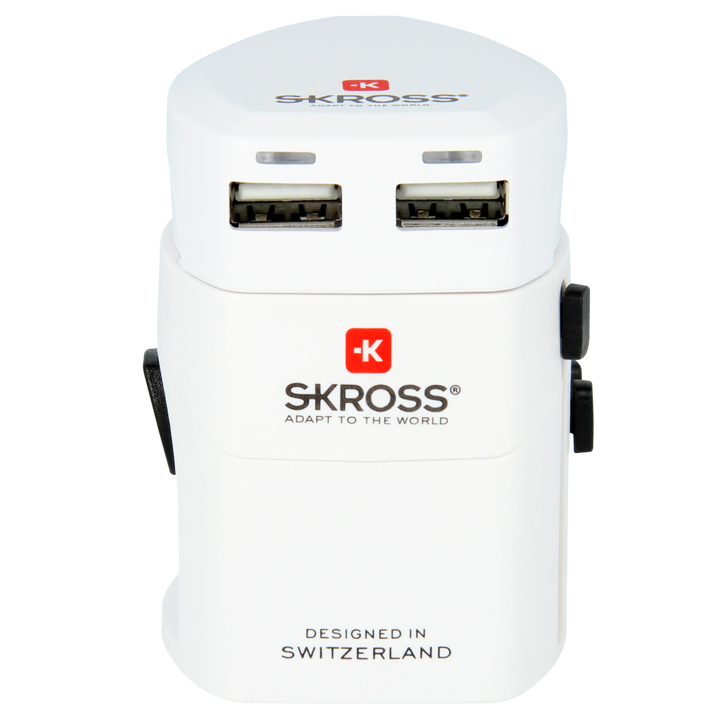 Gadgets 4 Geeks stocks 100% genuine SKROSS products sourced directly from manufacturers and approved authorised resellers. Sturdy and compact. 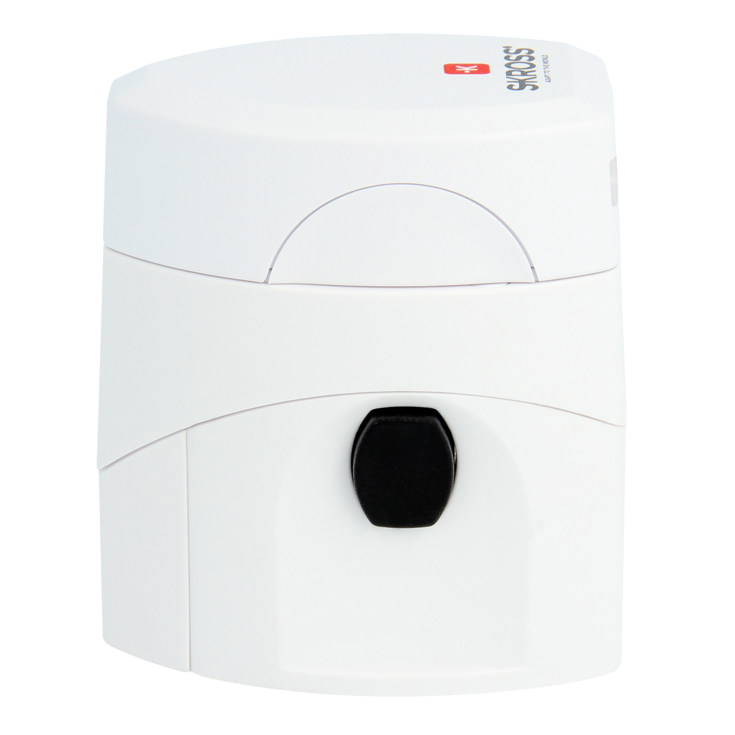 Has everything you need - especially 2 extra fuses, nicely kept in a hidden compartment. Last thing you'll want is for a fuse to blow up whilst you're travelling, and being stuck with a non-functioning travel adapter. SKROSS thought of everything! I got this model and it worked really well on my holiday abroad. 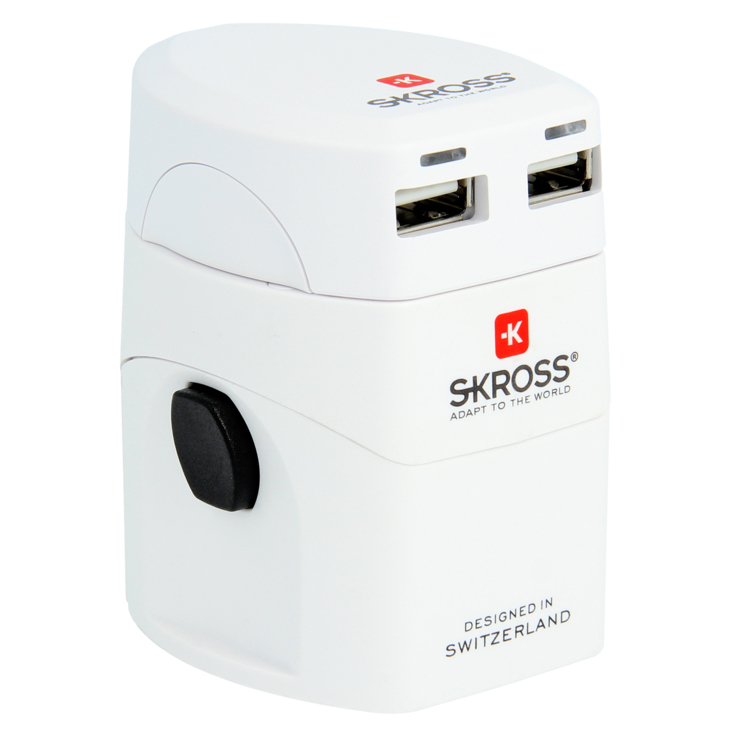 For my next holiday i needed another but saw the SKROS MUV model - I bought that one instead, and trust me, it's worth the extra money. I wish i had this advice (so i posted a review!) Do yourself a favour, if you're looking at this get the MUV adapter instead. Heaps more features and only $13 more.